Courtesy of Exploration Institute, Pacific Ocean. It has been 4 days that Ben Lecomte has not been able to swim due to squalls that have approached his path between Japan and California on The Swim. After reaching 583 nautical miles (1,080 km) off the coast of Japan, the weather and anticipated storms have required that Lecomte and team seek shelter so their decision was to head back to Japan. As crew chief Paul Lecomte said, "We’ve been motorsailing [back] to [Japan] with no trouble so far. It is weird to head west." 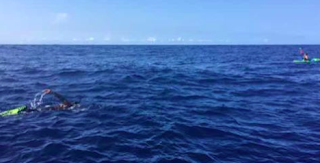 At this point, skipper Yoav Nevo and team are considering a variety of options for them to go back to Lecomte's last swimming point as soon as possible. The Exploration Institute writes, "Prior to beginning the swim, Ben and his crew of eight spent almost a month in Japan, finishing off the final preparations, including fitting the boat out to make it livable for six months at sea and stocking it with enough food for the crew. On the 5th of June, accompanied by his two children, Ben left dry land and took his first strokes in the Pacific Ocean. Hugging his two children goodbye after the first half mile, he set off on his journey across the Pacific to San Francisco. It was an emotional moment for everyone involved, crew members said goodbye to their friends and families for more than six months, and Ben’s dream of more than six years was finally becoming a reality. After two wonderful days of swimming, the crew were notified by their weather routing team on land of a system building with potential to evolve into a depression, in the path of Seeker and her crew. They were advised the best option would be to turn around and head back to safety on shore in Japan. After just getting into the groove of swimming it was hard for Ben and his crew to turn back, but wanted to follow the safest option for everyone involved. They took safety from the storm in the Yokohama marina where they waited out the bad weather and focused on finishing off the last tasks they had left for the boat. 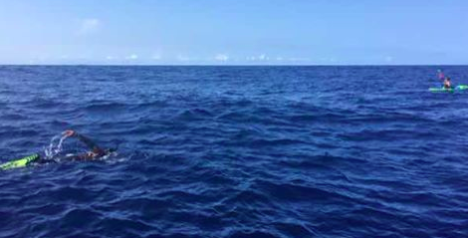 Four days later, the crew said goodbye to land for the last time and headed back to Ben’s last GPS location where he could continue on with his swim." This latest return back to shore is Lecomte's second re-do after spending a cumulative total of 171 hours in the water swimming. Follow up-to-date coverage here. His live tracker is here.